Daredevils around the world take flight, it’s time to unleash your inner Evel Knievel and turn to stunt driving! Here’s where you can jump through Flaming Hoops with a shopping cart or ATK for the Week 5 Fortnite challenge. You can complete this challenge with a shopping cart, but for the real speed demon experience, you need an ATK. If you’re having trouble finding one, we’ve got a separate guide on ATK golf cart locations. You need to jump through five flaming hoops to complete the challenge. Easy peasy! Go Northwest out of the Wailing Woods to find a hoop on the hill overlooking some houses. The Northern exit out of Paradise Palms, on the left of the junction. East of Paradise Palms there’s gorge jump with a flaming hoop in the middle. Near the Southwest exit of Paradise Palms, you’ll find another hoop. 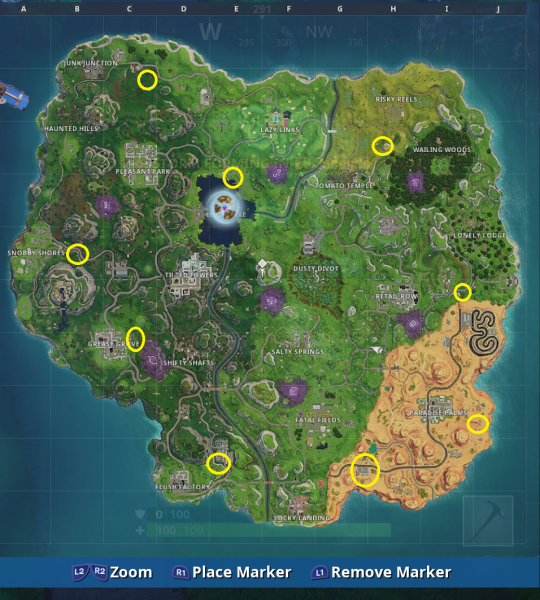 There’s another slightly Northeast of the Flush Factory. Head East of Greasy Grove and there will be a ramp which you can use to jump through the hoop. To the East of Snobby Shores, there’s another hoop waiting. Head to slightly Southeast at Junk Junction, near the dirt track to find another. Another Hoop can be found in the North of Leaky Lake.